[Sponsored] Contact lenes and Eyelashes from Pinkicon! Let's get going with the next BB Cream review from the popular Brand from Korea, BRTC! BRTC is a cosmeceutical brand served with botanical patent science (Miracle Blue) safely applicable even to sensitive skin by various irritations and troubles owing to the fact that the entire BRTC line contains developed Blue Complex, a plant patent ingredient, which provides an immediate soothing function as well as anti-oxidation based on elements from blue plant as lavender and chamomile used with its excellent soothing effect in traditional medical science throughout the world. Packaging: 8.5/10 - Similar to the previous BRTC BB Cream reviewed, adequately sized and in a tube form which promotes hygiene. Product Efficiency: 8.5/10 - This BB Cream gives a smooth and natural finish, leaves my skin feeling moisturized as promised. As I do have fairly sensitive skin, this product did not cause any adverse reaction which is good. Coverage: 8.75/10 - Of the 4 BB Creams from BRTC, I felt that this one was the one with the better coverage, about high medium to high coverage. Texture: 8/10 - It is slightly heavier than the BRTC Whitening & Repair BB Cream but still considerably lightweight and does not cause my skin to oil up quickly. Blendability : 9/10 - It blends splendidly - one of the things I love about BB Creams. Also, this is buildable so if you require a higher coverage, you can always apply more. Lasting Power: 9/10 - It lasted slightly longer than the BRTC Whitening & Repair BB Cream in terms of controlling the shine [about 4 hours] and lasted me throughout the whole day [I was out for about 10 hours, didn't need to touch up except to blot off some of the shine after 4 hours+. Availability: 7/10 - It is available exclusively in all SaSa Singapore outlets. Price: 9/10 - I personally think that the price is very reasonable, given that many Korea products are priced around this range and further more, it works really well. A tube can last you really long since I don't use a lot during each application. Repurchase: Maybe. BB Cream wise, I really liked it as it did not break me out and performed well in terms of coverage. However, as aforementioned, I have a lot of products on hand so I'm not sure if I will be able to repurchase one anytime soon and that no product meanwhile will be able to capture my heart more. As usual, do remember to "like" SaSaSg's Facebook Page as they have frequent promotions and giveaways so you definitely do not want to miss them! I will not say ladies for this entry because guys use the product I am about to review on too. BRTC has been well known for their BB Creams for a long time! About 4~5 years ago when I first used BB Creams, I've already heard of this brand so I am pretty excited to give this product a try. Not suprisingly, I think you guys can guess which BB Cream I jumped on first. Help firming care for all skin. Make natural skin expression is possible with high adhesion and natural color base. Include intensive whitening and firming care ingredients that create firm and bright skin. Since I've been slacking off, I will cut the beating around the bush thing. Packaging: 8.5/10 - Given the quantity of this product, the tube is adequately sized for handling and the squeeze tube makes dispensing of product sanitary. Product Efficiency: 8/10 - Of the claims it made, I believe most of them require long term usage commitment and I have quite a number of products so I always try to change around instead of just using one [I know I'm weird but I feel as if the other products will be lonely if I don't look at them -_-] so I can't put that claim to a test. However, in aspects such as keeping my skin moisturized and coverage, it works great! Coverage: 7.5/10 - This BB Cream, being buildable, has a medium to high coverage. It leaves my skin looking brighter, which is a plus point since I am always tired and definitely look ghastly without some human colour. Gives a very natural coverage without making me look too "made up." Texture: 8/10 - It is lightweight and does not cause my skin to oil up quickly; I do observe a little shine after about 3~4 hours and thus the need to touch up. Blendability : 9/10 - It blends splendidly and is buildable! Quickly posting this as I've mentioned in the previous post that there are 2 different "Step 5" of my skincare regime. More than 10% of vitamin complex highly concentrated within all products from the entire range. 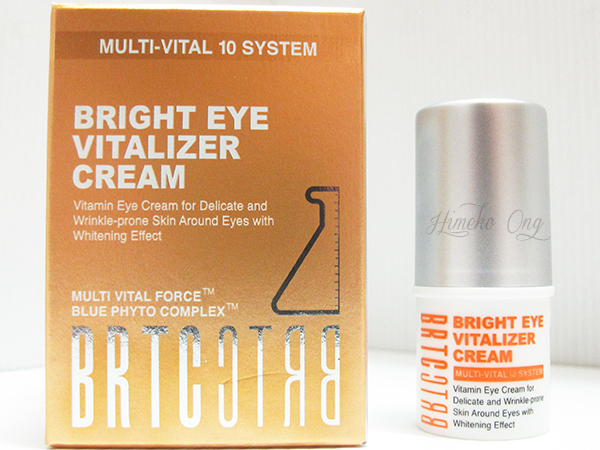 Multi Vital 10 Vitamin Line focus on whitening inner skin and dull, dark skin blemishes. Multi Vital 10 Line is the whitening line that revises dull skin tone to be even and gorgeous by using more than 10% concentration of various vitamin complexes as vitamin B5, E, F and B3, effective for creating dull and dark skin to be bright and illuminated. I will be talking about the fifth step for my night regime, Vitalizer White Gel. This Vitalizer White Gel is a whitening functional gel with contains multi vitamin capsules that makes clear and bright skin with intensive care on blemishes caused by pigment and allows dry, crumbly skin to be moist and smooth and also provides vitality to dull skin. This product claims to lock in moisture and the capsulated vitamins melt into skin, revitalizing stressed skin and inhibiting melanin production for a purer, brighter complexion. Packaging: 7.5/10 - Simple design and actually looks pretty with the orange tub. However, it is a little heavy and I am not a huge fan of things in a tub (sanitary reasons). Also, will be nice if it at least came with a spatula to scoop the product. Scent: 4.5/10 - The scent is detectable though less prominent that certain products from the same line (White Cream). I smell more of the Lavender. Whitening & Brightening Efficiency: 8.5/10 - Given that it has capsules concentrated vitamin C that melts into the gel and into your skin, I was expecting whitening from this product and thankfully, it worked well. Texture: 8/10 - It is a gel but not extremely viscous like many others out there. It does take longer to absorbed due to the thicker consistency and leaves a slightly sticky/ wet (?) feeling even after it is absorbed (which is quite common for gels/ sleeping packs). Ease of Use: 7/10 - While there is nothing hard about dipping your finger into the tub to get the product, I am definitely not a fan of that. Will be nice if they provided a spatula with it. Availability: 7/10 - It is available exclusively at all SaSa Outlets. Price: 7/10 - It cost SGD $35/50ml and it might seem steep compared to other brands out there but compared to other Korean brands, this is actually considered pretty economical. Repurchase: No. Look, this does not mean this isn't a great product; it's just that I am not a big fan of putting the last step "gel" in my night regime because when I was seeing a derm, he told me that I should not put too many moisturizing products in my regime (or even whitening but I'm kinda ignore him on that) as it is not good for my skin given my condition. Also, these products usually take longer to absorbed due to the thicker consistency and I don't like that feeling on my skin. Don't forget to "like" SaSa SG's Facebook Page for their latest promotions and updates! They have a lot of giveaways every now and then [and by a lot, I really meant A LOT] so you definitely don't want to miss out on that! I am not dead yet. My laptop is down and thus the only time I can use the laptop is when my brother is back home and let's face it, he is home once a week and that one day might not be a day where I am motivated to blog. Anyhow, I am already half done with this series so I will finish it up as I have more BRTC products [BB Creams, Stem Cell Mask] to share! I will be talking about the fifth step, Vitalizer White Cream. This step comes after Step 4 (Eye cream) for my day regime while I use Vitalizer White Gel (which I will talk about in the next entry) as the fifth step for my night regime. This Vitalizer White Cream is a cream with abundant vitamin A, B3, B5, and E that prevent skin damage and provide intensive lifting care to remove shadows of winkles. At the same time, it increases skin flexibility to brighten and firm up skin rough from malnutrition and stress. This product claims to help malnourished and stressed skin, giving it a purer and firmer complexion. Packaging: 9/10 - Simple design, frills free - white packaging helps make the outlook more crisp. Scent: 6.5/10 - The more prominent scent I detect is Citrus (lime and lemon more prominent than orange). Not unpleasant, I would say. Whitening & Brightening Efficiency: 8.5/10 - Given that the title of product states that it is a "White Cream," I do believe part of its function entails whitening (also, this whole line is dedicated to help whiten and brighten skin). I've used this product for about 2 weeks and it keeps my skin looking bright (also look more alive) and maintains the fairness of my skin. Moisturizing Efficiency: 7.5/10 - Though it does not state it helps to moisturize, I do see some moisturizing ingredients like Butyrospermum Parkii (Shea Butter) so I'm including this aspect in my review. I don't get dry skin with the change from my previous skincare product to this which goes to show that it is at the very least, on par with my previous product (which has moisturizing properties by the way). Texture: 9/10 - It is cream and I really like how fast it gets absorbed by my skin. I put this before my Sunblock and Tinted Moisturizer so it really helps to have products that gets absorbed fast. Ease of Use: 9/10 - Like many skincare products, this one comes in a squeeze tube which gives you have full control of the amount of product you dispense depending on the pressure you exert on the tube. Sanitary as of squeeze tubes. Price: 7/10 - It cost SGD $45/50ml and it might seem steep compared to other brands out there but compared to other Korean brands, this is right at the range. Repurchase: Maybe. I have that same overused excuse but on top of that, I do see myself leaning quite a bit to this as a moisturizer for my day regime as it is really lightweight and gets absorbed fast. Besides, it's always nice to have something that works for whitening AND moisturizing in a moisturizer cream! BRTC is a very popular brand in Korea and my love for it increases every time I look back and talk about it. I will be talking about the fourth step, eye cream. This Bright Eye Vitalizer Cream is a Vitamin spot balm for intensive whitening on dark imperfections and damaged skin spots. It is a concentrated stick balm containing more than 10% of vitamin A, B3, B5, C, and E and gives off refreshing feeling upon usage. This product claims to be able to help intensive melanin care and skin restoration to transform dark complexion into a bright one. Packaging: 9/10 - Simple and easy on the eyes packaging with most information found on the box once again. Whitening & Brightening Efficiency: 8.5/10 - This product claims that it can help to whiten and I do observe my dark circles becoming lighter and while my eye area looks brightened, I'm not too sure if it is because of the effect from the eye stick or because of the lightening of dark circles that makes me look more "alive" and therefore, brighter. Either way, both effects are observed so thumbs up! Moisturizing Efficiency: 7.5/10 - I don't really know how to see if my eye area is moisturized... It did make my eyes less puffy, does this show the efficiency of the moisturizing aspect? Anyhow, my eye area don't feel any drier so I believe it works. Texture: 9/10 - It is very smooth on skin since it is in a stick form. I love the cooling effect it leaves on my skin upon application! Ease of Use: 9/10 - I really love this packaging! I've used those roller packaging before but this one feels a lot smoother on my skin. I had to take a point off as pumps are still more sanitary though slightly more of a hassle to use. Repurchase: Yes. I really like how convenient and easy it is to apply. It does make my eyes look less puffy and dark circles less obvious so for a product that works well, I definitely will repurchase. Besides, it makes me happy every time it touches my eye area because I will anticipate the cooling effect! 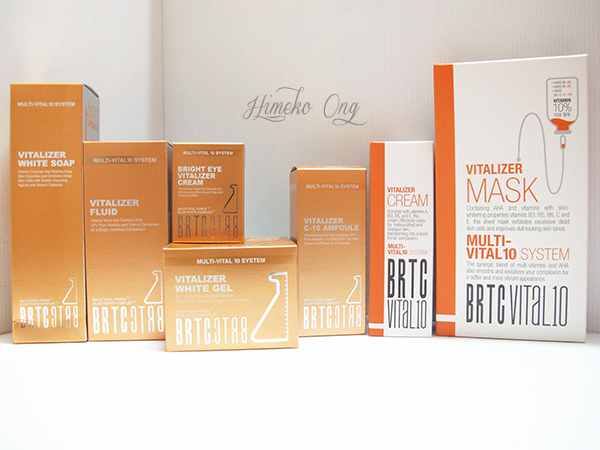 BRTC is a very popular brand in Korea and the more I use it, the more I love it. I'm about halfway through, more to come! Today, I will be talking about the third step, serum. 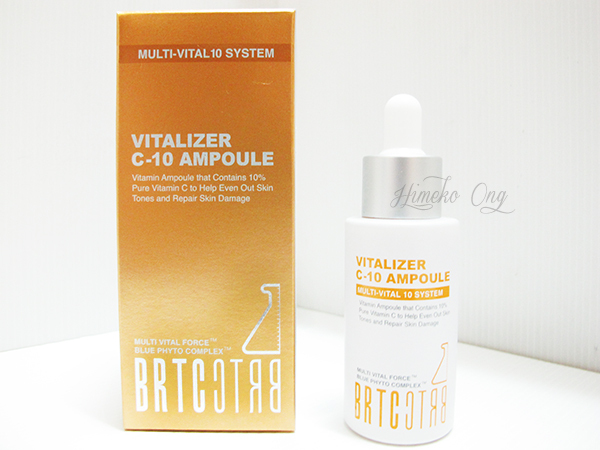 This Vitalizer C-10 Ampoule is an ampoule with 10% of vitamin C stablized through bio polymer process for skin tone upgrade and vitalization and also includes abundant amount of other vitamins such as B3, B5, A, E, and F.
This product claims to be able to provide intensive whitening care inside the skin along with increasing of energy level through moisturizing and nutrient supply to create bright and clear skin. Packaging: 8.5/10 - Simple and easy on the eyes packaging with most information found on the box once again. Scent: 5/10 - Compared to the cleanser and toner, this one smells less citrus-y and more towards Lavender and Fig. I don't dislike it but I still prefer citrus-y to this. 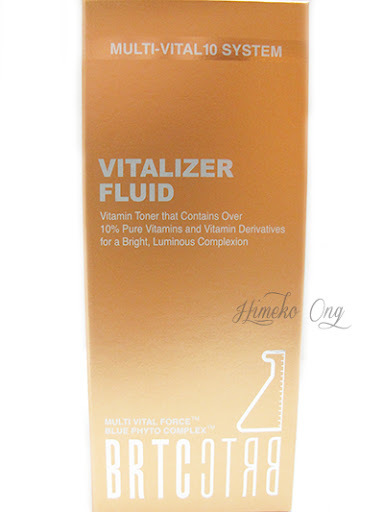 Whitening & Brightening Efficiency: 8.5/10 - This product claims that it can help to both whiten and brighten. The concentration for ampoules are higher and I do see significant results after using this for a week. Moisturizing Efficiency: 8/10 - I feel my that skin is more supple after using this (and of course, with the whole line) so I do believe it works well in this aspect too. Texture: 8/10 - It is liquid and not difficult to work with for an ampoule. Ease of Use: 9.5/10 - Standard dispensing for serums/ ampoules - with a dropper. No complains about it since I can control how much I need with good accuracy (drop by drop can't go wrong) and very sanitary too. Availability: 7/10 - It is available exclusively at all SaSa Outlets! Price: 9/10 - It cost SGD $48/30mL and I have to say it is really economical for a serum/ampoule! Repurchase: Yes. I really see myself repurchasing it because firstly, it works and secondly, it is so economical! BRTC is a very popular brand in Korea and I can see why. So far, I don't have bad things to say about their range, only praises. You will get to see more review from this line in the next few days. Well, firstly, they shower me with so much love and secondly, it has all the products from the same line and I will be talking about them in order as I've mentioned in the previous review for the White Soap! 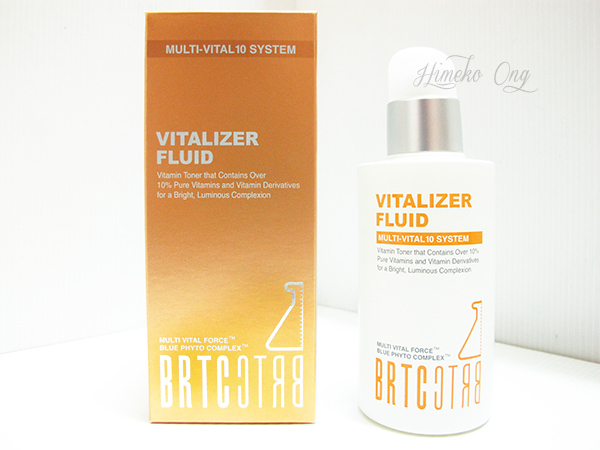 This Vitalizer fluid is a Vitamin toner aimed to create bright skin. It contains more than 10% of vitamin A, B3, B5, C, E.
This product claims to be able to penetrate deep inside skin to provide intensive whitening, add vitality whilist controlling imbalance within the skin and provide abundant moisture to create clean and clear skin. Packaging: 7/10 - I think the packaging is pretty and very simple. Most of the information are found on the cardboard box instead of being printed on the bottle again. There is a lid to cover opening of the nozzle, which I really liked. However, I had to take quite a bit of points off despite loving the visual packaging a lot because the bottle is actually made of glass (I think) and it is quite heavy. I'm a little clumsy so I cannot imagine if I actually drop it and the heavy bottle actually adds to the probability of that happening. Scent: 7/10 - Like the White Soap Cleanser, it has a citrus-y smell but this time, it is because of the Lemon extract. The Lavender smell in this toner is more prominent than that of the White Soap. Whitening & Brightening Efficiency: 8/10 - I always believe that whitening product comes with brightening and in this case, I do see both effects. After application, I can see my skin looking brighter and "more alive" and with prolonged use (about 2 weeks into using them), I can see whitening effect! Moisturizing Efficiency: 7/10 - Though the product claims to focus on whitening, it also claims to provide moisture and I do believe it does help in keeping my skin moisturized since I don't experience any skin dryness. Texture: 8/10 - It is liquid so I will recommend using a cotton pad. Oh yes, do remember to PAT the toner into your skin, not SWIPE. A lot of people have the misconception that toner is supposed to wash away the dirt that cleanser cannot remove so you have to swipe it to remove the dirt. Big no-no! Ease of Use: 8.5/10 - Again, I love products with pumps/ nozzle because I feel it is much more sanitary and the fact that it even comes with a cap to keep the opening of the nozzle clean makes me love it even more! Price: 7/10 - It cost SGD $39/120mL and I have to say it is indeed steep compared to many other cleansers available in the market [E.g. Drugstore brands]. However, compared to other Korean brands available locally, the price is actually pretty reasonable and on par with its competitors. Repurchase: Maybe. I like the smell and I've seen good effects after using the products. I think you should be sick of this reason but I do indeed have a lot of skincare products in my cupboard so I don't think I will need to purchase more any time soon and by the time I need to, I will definitely have a great headache. 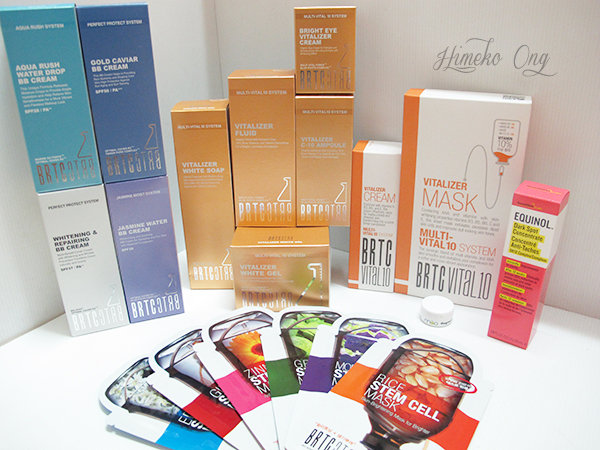 BRTC is a very popular brand in Korea itself so I'm glad to have started using Korea skincare products with it. So far, I don't have bad things to say about their range yet. You will get to see more review from this line in the next few days. Will you look at the bunch of stuff they gave me?! So much love from them as usual. I received these items quite some time ago so I've used them all by now [except the masks] and am ready to give you my reviews! I am going to try and review all the items in the order of how you should use it in your skincare regime. This product claims to be able to remove makeup, bodily waste, sebum as well as dead skin cell at once with refreshing, plentiful foam. A moist film is created and the vitamin capsules burst when cleansing, leaving the skin moisturized and refreshed without feeling tight. Packaging: 8.5/10 - I think the packaging is really pretty! I've been quite into bright orange colour these days so this really appealed to me. While the little capsules are concentrated with vitamin goodness, it looks really pretty just being suspended in the gel base of the cleanser. Scent: 6/10 - There is a scent but nothing unpleasant. I think it smells quite "citrus-y" and I really like it! Must be because of the orange extract but I can't smell the Lavender as strongly though. Product Efficiency: 8.5/10 - The product description says that it creates a moist film to protect our skin from being dry after cleansing but personally, I do prefer feeling slight tightness as it makes me feel ... cleaner. Yes, that's one of my little peeves but anyhow, I did not experience any breakouts after using this so I do believe that this is doing a good job in cleansing my skin properly. If you are looking for a gentle and good cleanser, this might just be the one for you. Moisturizing Efficiency: 9/10 - As mentioned above, my skin did not feel tight after cleansing. In fact, it feels quite bouncy after cleansing and that's really nice! Texture: 9/10 - It is gel based so it is not hard to handle at all. It gets spread all over your face very easily and does not drip from your hands. Ease of Use: 7.75/10 - As I've mentioned numerous times, I love products with pumps/ nozzle because I feel it is much more sanitary. While this product comes with a nozzle, I felt that the amount of product being dispensed per pump is too little and I usually have to pump it twice to twice and a half to get enough product to spread over my whole face. Other than this small issue, it's pretty idiot proof on how to dispense it. Price: 7.5/10 - It cost SGD $35/200mL and I have to say it is a little steep compared to many other cleansers available in the market [e.g. drugstores.] However, compared to other Korean brands available locally, the price is actually pretty reasonable and on par with its competitors. Repurchase: Maybe. I like the smell and the fact that it can clean my face well without over drying my skin is definitely a huge plus point. Only thing holding me back on my verdict is the fact that I still have quite a few brand new cleansers in my cupboard. BRTC is actually a very popular brand in Korea itself so I'm glad to have started using Korea skincare products with it. So far, I don't have bad things to say about their range yet. You will get to see more review from this line in the next few days!